The Arizona senator's name was featured on the defense bill the president signed today, but not in the president's remarks at the bill signing. In extended remarks during a visit to Fort Drum in upstate New York to sign the John S. McCain National Defense Authorization Act for Fiscal Year 2019 — this year's version of an annual bill that sets defense policy — Trump chose not to mention the former prisoner of war and Senate Armed Services Committee chairman who is battling brain cancer. He even omitted McCain's name when citing the title of the bill. The two men have long been fierce critics of each other, with McCain calling Trump's supporters "crazies" in 2015 and Trump retaliating by questioning whether McCain, who was subjected to torture in a Vietnamese prison camp, is really a "war hero" because "he was captured." The snub at Fort Drum, home to the combat aviation brigade of the Army's 10th Mountain Division, did not escape the notice of McCain's allies. "For those asking did I expect Trump to be an a------ today. No more than I expected it to be Monday," Mark Salter, McCain's longtime aide, wrote on Twitter. McCain's condition — dire enough that a recent HBO documentary on him was titled "John McCain: For Whom the Bell Tolls" — has not stopped Trump from deriding the Arizona senator at political rallies. Though Trump does not use his name, he tells crowds that he would have been able to repeal Obamacare if not for a thumbs-down sign from one senator — McCain. The senator's own statement included Trump's name in the headline and in a preamble written by staff. But the words attributed to McCain did not. 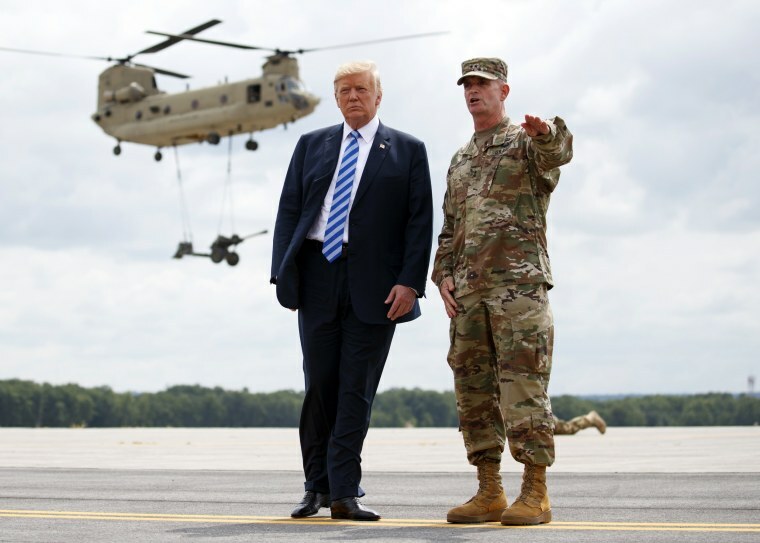 "I'm very proud that the National Defense Authorization Act for Fiscal Year 2019 has been signed into law," he said.